Geolocation is the process of determining your location on Earth. TorpedoMen uses this to search for special deals in your area. The browser you are using will ask you for your permission to give your location. Geolocation is the process of identifying your location via your mobile device, tablet, laptop or even desktop computer. The latitude and longitude of your location are then plotted on a map along with the locations of businesses who have special discounts that meet your search criteria. By default, your browser will have geolocation enabled. If you have disabled geolocation in your browser, it's easy to enable it again. If you can get my location, do you know who I am? No. The only information known is there is a device at a location. That's it. TorpedoMen cannot tell who you are or track anything you do. Accuracy varies from location to location. Most of the time geolocation technology can pinpoint your location to within feet. However, in other areas it might be much more than that. It's typically a little more accurate on mobile devices (smart phones and tablets) than it is on desktop computers. 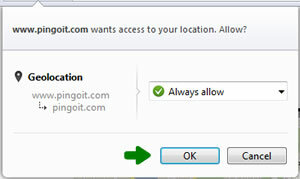 What if I have chosen not to allow my browser to give my location and now I would like to give it? 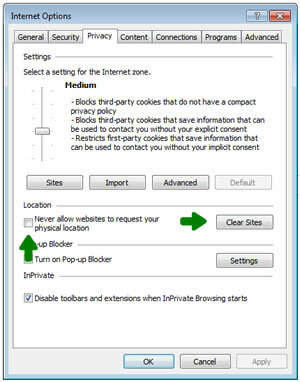 You can easily allow your browser to give your location. Click here to see how for each of the major browsers. Where can I learn more about Geolocation? 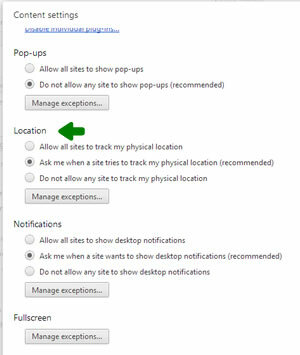 Under Tools>> Internet Options>> Privacy - look under the Location section, press the "Clear Sites" button and be sure "Never allow websites to request your physical location" is unchecked. Press OK.
Then refresh the screen showing TorpedoMen by pressing the F5 button and you should see a box appear asking for you permission to give your location. Select "Allow once" or Options for this site and "Always allow". Here's more information on geolocation in Internet Explorer. Open Firefox and navigate to TorpedoMen.com. From the Tools menu at the top of your Firefox window (if it's not visible, press F11), select Page Info. Select the Permissions tab. Change the setting for Share Location. Then refresh the screen showing TorpedoMen by pressing the F5 button and you should see a box appear asking for you permission to give your location. Select Share Location or choose from the dropdown list. Here's more information on geolocation from Mozilla Firefox. Click the Chrome menu icon on the Chrome Toolbar. Select Settings. Click Show Advanced Settings (at the bottom of screen). In the "Privacy" section click Content Settings. In the dialog that appears, scroll down to the "Location" section. Select your default permission for future location. Click Manage exceptions to remove previously-granted permissions or denials for specific sites. Open Chrome and goto TorpedoMen.com and you should see a box appear asking for your permission to give your location. Select Allow or choose from the dropdown list. Here's more information from Google Chrome. 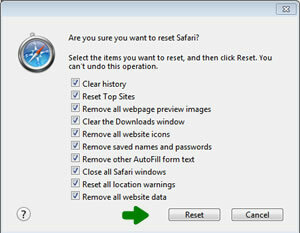 You can reset website authorizations in Safari 5 by choosing Reset Safari from the Safari menu, then enabling "Reset all location warnings" checkbox (don't select the other checkboxes unless you are sure you want to reset those as well). Open Safari and goto TorpedoMen.com and you should see a box appear asking for your permission to give your location. Select Allow. Here's more information from Apple. From the Opera menu, go to Settings > Preferences > Advanced > Network, and check "Enable geolocation". Open Opera and goto TorpedoMen.com and you should see a box appear asking for your permission to give your location. Select Allow. Here's more information from Opera.